Parth Patel on his way to 27 for Wisbech at Ketton. Photo: David Lowndes. Ketton appear to be home and hosed in Cambs Division One with 10 matches still remaining. The Pit Lane pitbulls made it 11 wins out of 11 completed matches after seeing off Wisbech by three wickets (July 8). Stylish Tom Sole bowling for Ketton against Wisbech. Photo: David Lowndes. The Fenmen started the day in second and missed a great chance to claim Ketton’s proud perfect record after reducing their hosts to 107-7 chasing 155. But Ketton usually find a way out of a hole. This time unsung hero Matt Milner (31no) and captain fantastic Rob Vitas (18no) combined to add 49 for the eighth wicket. Earlier Tom Sole had bashed 49 from 42 balls for Ketton. He also took 3-35 to challenge Milner (3-29) for man-of-the-match honours. Jamie Gollands (5-24) was the Wisbech man who made Ketton sweat. Jason Esser batting for Wisbech against Ketton at Pit Lane. Photo: David Lowndes. Ramsey are now up to second, albeit 50 points behind Ketton, after a nail-biting one-wicket win over Waresley at Cricketfield Lane. Aussie Ryan Smith, who followed a three-wicket return with 69, was Ramsey’s star man. Nassington’s smooth progress up the table continued with a 65-run win at fading champions Foxton. Dan Robinson cracked 80 of Nassington’s 236-6. Hugo Bell (4-35) was the pick of their bowlers. It’s five wins in a row now for Nassington. Mohammaed Raheel has enjoyed a good couple of days. On Friday (July 7) he smacked a rapid half century to steer King’s Keys into a T20 final at Ketton’s expense and the following day he hammered a brutal 75 not out for Godmanchester against March. Raheel faced just 39 balls and thrashed six sixes and six fours to propel Godmanchester to 306-7 in their 50 overs. It was a crucial knock as well as March made 294 all out in reply. Brandon Phillips (60) and Spencer Saberton (54) scored well for March who have dropped into the bottom two. 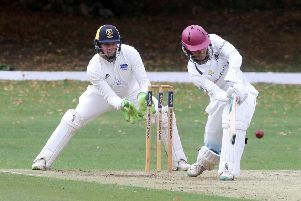 Ufford Park and Castor maintained their interest in promotion from Division Two with six and five-wicket wins at Blunham and Burwell seconds respectively. Ed Cox (5-18) helped Ufford dismiss Blunham for just 113, while Ryan ‘Rhino’ Evans claimed 4-21 for Castor as Burwell were shot out for 147. Nassington 236-6 (D. Robinson 80, M. Shifran 42, A. Bandaranaike 37no, J. Pope 37). Wisbech 155 (D. Haynes 35, P. Patel 27, M. Milner 3-29, T. Sole 3-35, P. Rowe 2-31). Ketton 156-7 (T. Sole 49, M. Milner 31no, Z. Manzoor 21, J. Gollands 5-24). Godmanchester 306-7 (M. Raheel 75no, P. Swannell 62, T. Aziz 61, S. Clarke 2-30, C. Ringham 2-41). March 294 (B. Phillips 60, S. Saberton 54, J. Hilliard 34, A. Wright 32, A. Gupta 4-60). Waresley 252-9 (R. Smith 3wkts, T. West 3wkts). Ramsey 253-9 (R. Smith 69, J. Markland 49, M. Cafferkey 38, M. Edwards 33no). Blunham 113 (E. Cox 5-18, P. Bentley 2-36). Ufford Park 114-4 (T. Hussain 42, J. Harrington 29no). Burwell 147 (R. Evans 4-32, R. Smith 2-21). Castor 148-5 (A. Steels 46, S. Dockerill 42).